I don’t know about where you live, but here in Southern Idaho, the beautiful geranium plant is a pretty standard staple in many home gardens. Its dense umbels of colorful flowers and fuzzy, serrated, heart-shaped leaves not only make a beautiful statement—they smell amazing. Interestingly, there are hundreds of different species of the Pelargonium genus (which is the fancy way to say “geranium plant”), but only a few of those produce essential oils. Here, we’re going to talk about Geranium Egyptian (Pelargonium x asperum), which is sourced directly from—you guessed it—Egypt, and is one of two varieties of Geranium EO sold here at Plant Therapy. So if you have a bottle, are thinking about buying a bottle, or don’t even realize you want a bottle (yet! ), let’s go over some really easy and practical ways to bring Geranium Egyptian into your life. Move over diamonds, there’s a new bestie in town! And unlike that beautiful bling, Geranium has some real practical uses for a girl in need. Hailed for being a gentle bringer of grace and harmony, this essential oil really steps up to the plate when those uncomfortable womanly symptoms arise. For menstrual cramps, simply dilute Geranium Egyptian in your favorite carrier oil and massage onto your abdomen. For a safe 3% dilution, all you need is 2 teaspoons of carrier oil and 9 drops of Geranium Egyptian. As this essential oil is well-known for its beneficial effects on women’s reproductive health, it can help soothe discomfort related to “that time of the month.” To use alongside another great essential oil for womanly concerns, Clary Sage, try blending 3 drops of each in two teaspoons of Evening Primrose Refined Carrier Oil (which also assists in comforting during these times) and massage onto the abdomen. Women who are undergoing hormonal changes may also find relief in Geranium Egyptian. It has a fantastic balancing effect on emotions that are running wild! Plus, it can help you feel more stable during times of moodiness, helping to reduce feelings of irritability and nervous tension . 2. Stay calm and carry on! For reasons too numerous to list, we all get stressed out sometimes. 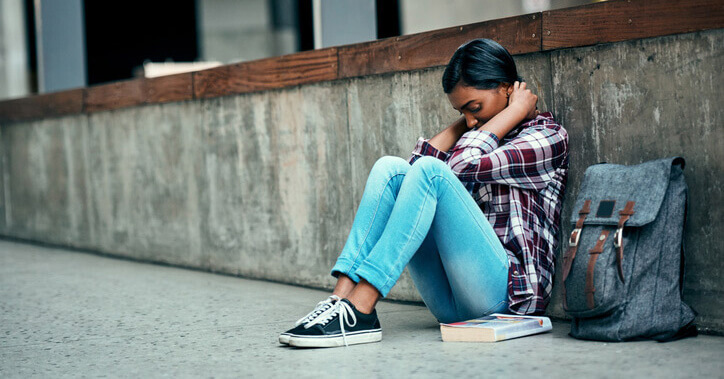 Whether work is exhausting you, responsibilities at home are piling up, or things in life aren’t lining up quite right for you, frayed nerves make everything worse. Let Geranium Egyptian be that friend whose shoulder is always ready for you to lean on! It helps to reduce those unpleasant feelings that can crop up when stress hits, and even start to lessen the impact of any consistent, unhappy thoughts [2,3]. Geranium Egyptian has an uplifting and fresh, sweet, green aroma that helps to ease tension built up from the stress of everyday life. It’s a great choice for enhancing positive feelings and promoting a sense of inner peace by lifting the spirits . Try diffusing alone or blend it with essential oils that are known to be grounding and calming, like Vetiver or Patchouli, to create a very relaxing environment that will help get you back to your best self. To learn more about essential oils that can help with feelings associated with stress, visit 7 Essential Oils to Help with Anxiety, Stress, and Depression. As an essential oil that does wonders for nerves and tension associated with worry and stress, Geranium Egyptian can also promote restful sleep. 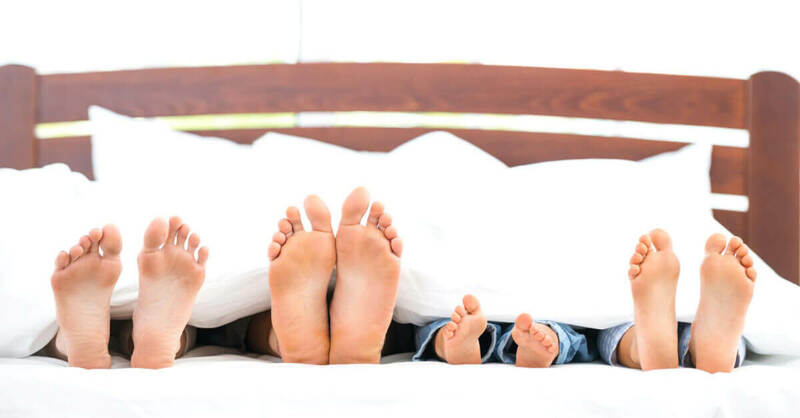 Its balancing effect on the emotions will help to relax both your mind and your body, helping you get to sleep faster and stay asleep longer. Try adding a couple of drops right onto a cotton ball and placing near your bedside or tucking near your pillow before going to bed. 4. Enjoy healthy, glowing skin. We can’t talk about Geranium Egyptian without gushing over how great it is for complexion! This skin-balancing oil is gentle enough to use on mature skin but tough enough to help with blemishes, dryness, and the appearance of wrinkles. It works to help balance the production of sebum, which is the natural oil that helps keep skin supple. This means that no matter your skin-type, Geranium Egyptian may be able to give you that glow you’ve always been searching for. To help improve the overall skin complexion on your face, just take a teaspoon of your favorite skin-loving carrier oil, face wash, or lotion and add one single drop of Geranium Egyptian. Apply a pea-sized amount it to a clean face in the evenings. Love it enough to make a bigger batch? That’s great! Just please keep in mind our recommendation for a 1% dilution on the face. And of course, we can’t forget about the skin that’s not on your face! Geranium Egyptian is a popular essential oil to use for massage applications. It has a beautiful aroma that supports positive emotions. It is also grounding and can instantly help create feelings of calm and ease, boosting the stress-fighting power of a massage. 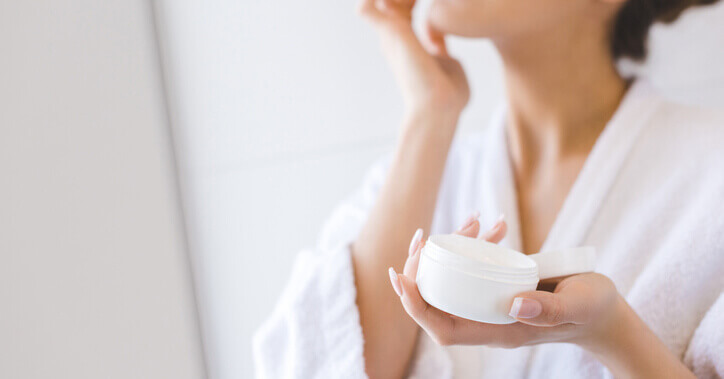 We recommend a 2-4% dilution for topical application to help enhance the appearance of healthy skin and leave you feeling relaxed and uplifted. New to dilution or just need a refresher? Check out our comprehensive guide to diluting essential oils HERE. Want to learn more about the two Geranium EOs Plant Therapy offers? 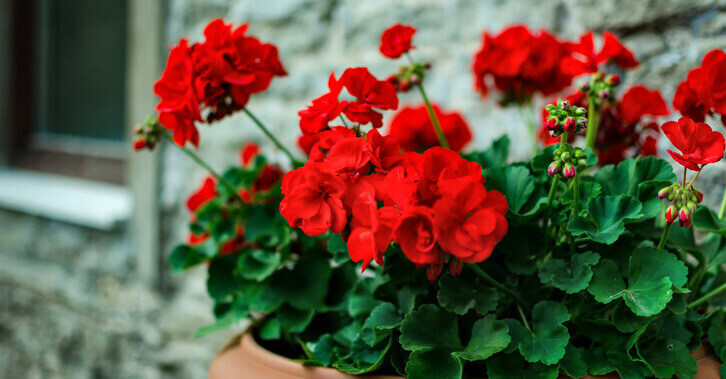 Read our blog Which Geranium Should You Choose? 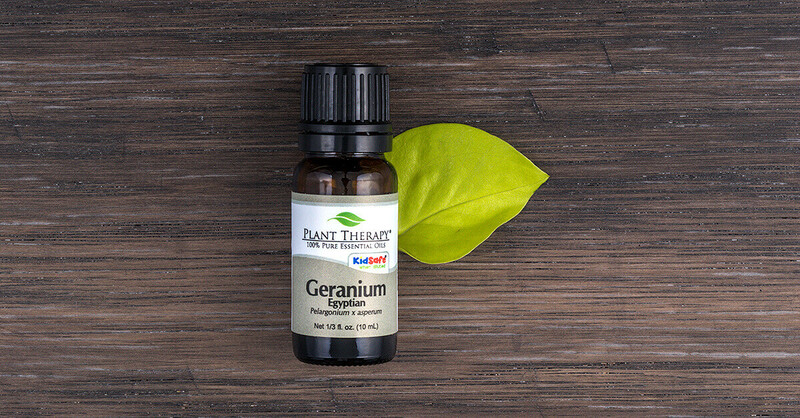 Get 15% off Geranium Egyptian today with promo code SPOTLIGHT31! Purchon, N., & Cantele, L. (2014). The Complete Aromatherapy and Essential Oils Handbook for Everyday Wellness Paperback. Pg. 39. Morris, N., Birtwistle, S., & Toms, M. (1995). Anxiety Reduction. International Journal of Aromatherapy 7, 2, 33-39. Perry, N. and Perry, E. (2006) Aromatherapy in the management of psychiatric disorders: clinical and neuropharmacological perspectives. CNS Drugs 20, 4, 257-280. Perry, N., & Perry, E. (2006). Aromatherapy in the management of psychiatric disorders: clinical and neuropharmacological perspectives. CNS Drugs 20, 4, 257-280. Harding, J. (2008). The essential oils handbook. Watkins: London. Im learning so many new things from this site. I’ve been interested in Geranium for awhile now, but had no idea about all its befits! This will be going on my wish list ! I have endocrine issues and terrible cycles. Sounds like I need to get some geranium and clary sage. Thanks for the info! One of my favorites for face skin treatment. Love to blend it with Franckincense or Vetiver. love this in facial cream lotion. Great results! I love the way it makes my skin feel. The aroma is a bit strong, so I i=use it in masks for facial washes that will be washing off. I often add a drop to my creamy body butter for a treat. I’ve used this in a .5% dilution on cold sores. Helps to heal them quickly and it smells wonderful. I love love Geranium oil. I use both of them quite a bit. Smells great and awesome benefits so cant go wrong with either one. Thanks again for offering discount on another great oil. Next oil to go on my list ! I love this stuff. It’s great for that time of the month, calming me down, and for date night. I love the way it smells!!! I enjoy geranium to help manage pms symptoms. I never knew it was good for sleep. I look forward to trying it in a sleep blend. I just added this oil to my growing stash of oils. I enjoy the smell and look forward to using with Clary Sage in a roller for cramps. Thank you for all the info to use it in multiple ways! Great article! Lots of good information, and I love getting all the ideas from reading the comments Can’t wait to use this in a blend for supporting female hormones. This is next on my list of oils to try, so many amazing uses! I already love the scent of geranium — great to know it also has so many useful applications! Will definitely be trying out some of these recommendations (and using that promo code!). I’ve been using this in my face oil blend and in my menstrual oil blend. I have two bottles, I never want to run out. This sounds wonderful! Is there a way to use this oil to calm children? Absolutely! You can dilute it in a carrier oil for them to enjoy Geranium topically and it is also great in a diffuser 🙂 Plus, it’s KidSafe, meaning it’s safe for young children to use. Hope this helps! Although I am not a fan of the scent (I’m just sensitive to florals), it is my favorite to use in combination with Clary Sage for everything female/hormone related. Seriously….amazing! I recently bought PT’s Geranium Egyptian to add to some skin care products. I really appreciate this article and all of the additional uses. Thanks Plant Therapy for the educational information that you always share! I love floral scents and can’t wait to try this with Vetiver and Patchouli. Thanks for this information. Just bought Geranium Bourbon – is it a fairly close substitute? Definitely want to try the cotton ball thing. Looking to order it soon! I had no idea of all the benefits! This will be next on my list. I often use geranium Bourbon in my face creams but I need to get geranium Egyptian for the added benefits! I had no idea this oil could help with sleep. I’ve been wanting to expiremwnt with different oils so I do not get tired of the same old same old. My friend ordered me this oil, I cannot wait to try putting some on a Cotten ball to place by my bedside! I love this oil, and I love Plant Therapy. I’m so happy to have found these pure oils that are much more reasonably priced than some others that we all know! I’ve had my eye on this oil for awhile now and finally decided to purchase when it became the spotlight oil of the week! I love the floral scent, LOVE that it’s “kid safe,” and all the hidden uses I never realized it had! I love learning all of the uses of different oils. This article was really informative. Thank you! The comments for the eo are amazing!! I can not wait to try it! Ordering today!! I love reading the comments for ideas on how to this oils as well! I love this oil. I use it in my night time face serum and it makes my skin feel great. For me I find it really helps my skin when my hormones cause breakouts certian times on the month. Haven’t tried it for cramps yet but looks like I may have to give it a try. I love Geranium in calming blends. I didn’t realize it was also supportive for women’s hormonal/monthly cycle concerns. One more use for this sweet-smelling, skin-friendly oil. Are the benefits similar for Geranium Bourbon and Rose Geranium? Thank you, Plant Therapy, this post was perfectly timed. This is truly a versatile oil which I try never to run out of. In addition to the great benefits listed here, I find it great for repelling fleas, ticks, and other pesky bugs in combination with other oils. I use this with my facial lotion a couple times a week, and I’ve really noticed a difference. I really love it! I should have ordered the bigger bottle! I really enjoy the scent of geranium leaves and flowers in my garden, and was surprised to find I strongly dislike the scent of either type of Geranium oil. Any suggestions to mask the scent or tone down the scent in face oils but still get the benefits? I want to use my Geranium…. I love geranium for cramps. I dilute it in a roller and apply it right to my tummy and I get almost instant relief. This stuff is magical! It sounds amazing! I just ordered and can’t wait to use it. Thanks for all the ideas! Thank you so much for your kind comment, Kelly! And welcome to the family! I was using Doterra for awhile, and I agree, the quality for PT is just as good. So glad I found PT! I have a much bigger collection of EO’s, and for a fraction of the cost of Doterra. I just bought this! I can’t wait to try some of these. It’s also one of the Basic Care Kit oils in The Complete Book of Essential Oils, so I know it’s super versatile! Thanks for these great ideas. Geranium grew on me so quickly. i love to use in my facial serums and just about anything i want add that wonderful scent to. It’s nice to know it helps with sleep too. I actually just bought Geranium Egyptian not too long ago because I had heard so many good things about it, but I haven’t actually used it yet. Thanks for all the good ideas on the ways I can use it. Wow– great info! I originally purchased geranium bourbon last summer to use in a facial serum, with wonderful results! But it is so strong smelling… even if I just use a little, very pungent. Just got the Egyptian yesterday and it is amazing! Fresh, light, beautiful…I will use it much more often now, and thank you for the great ideas! I tried Geranium egyptian in my sleep blend last night and it worked so well! It really helped calm my racing mind and allowed me to sleep peacefully. This is my new go-to oil for a great nights sleep! I am loving all of the different ways to use Geranium. I bought some to use in a facial serum and it has been working great! A little goes a long way because the scent can be strong. I am going to diffuse it in my car for my work commutes this week. I like these posts, it’s great to learn new ways to use the spolight oils. I’ve used this oil for hormonal issues, for baths, and perfume, but hadn’t considered the other benefits. I think I’ll incorporate this into my next sleep blend and next facial oil blend. I made salt scrubs using germanium. I have this oil! I love the smell of it! I never even thought of pairing it with my Vetiver! I think I’ll do that today! Thanks! Love this! Thank you so much for reminding me of ways to use this beautiful oil. I don’t pull it out nearly enough as I should! Thank you for this great info! Could you help me understand the difference between Pelargonium graveolens and Pelargonium x asperum? Are the names used interchangeably or are they different species? Thanks! Thank you for this post. Geranium Egyptian has now topped my wish list. Sounds like just the right oil to use as an anti-aging facial cream. The DIY body cream posted on facebook is a must-try. This oil also sounds like a unique scent. Can’t wait to try! I like to blend it with rose, they smell great together! I have been wanting to try Geranium, but wasn’t sure which to get. 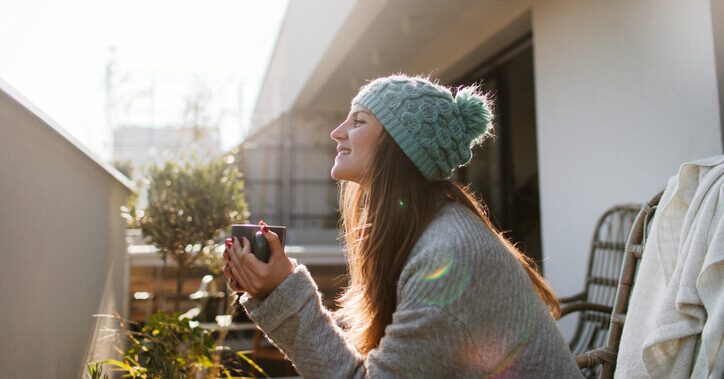 Thanks for the blog post, because this is the one I need! And I love that it is so versatile and has some of the same properties as Clary Sage as far as for women. It also helps that a Geranium is one of my favorite flowers! Wonderful information, I will need to try this for that time of the month! Could you substitute Bourbon for Egyptian and have similar benefits? Thank you Plant Therapy, I always look forward to learning so much from your blogs. I had no idea about the benefits of Geranium and am looking forward to using this especially for stress relief and sleep. I’m looking for oils and blends that help with anxiety too and it looks like this will be a great addition. This is becoming one of my favorite essential oils. I just had ankle surgery and plan on using it for my scars. So happy to find other uses for this oil as well since it smells delightful. I have been wanting to try geranium oil for awhile now! I’ve been wanting to use it in perfumes, but I didn’t know all of the other benefits it has to offer. Thank you for sharing! This seems like just the oil I need. Who couldn’t benefit from decreased stress and more sleep, am I right? This blog is full of great information. Thank you, Plant Therapy! Love Geranium and did not know of all it’s uses! Thank you!! Wow, I learned some new things! I will be incorporating this oil in my oil routine. Wonderful uses. Definitely a must have!